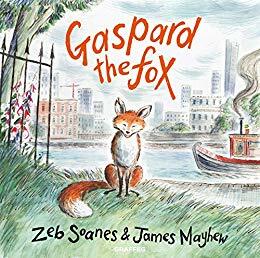 Today I’m reviewing a children’s book, Gaspard the Fox by Zeb Soanes and illustrated by James Mayhew. Here’s a little bit about the book, which is published by independent Welsh publisher, Graffeg. By the way, their website has many things of beauty on it so it’s well worth a look. Meet Gaspard the Fox as he sets out one summer evening in search of adventure and something to eat. This charming and humorous picture book celebrates urban foxes and their relationship with the humans and animals they share the city with. With stunning original illustrations by award-winning children’s book author James Mayhew, this is the first in a series of collaborations between Zeb and James following the adventures of Gaspard and his friends. I’m a huge lover of foxes. I think they’re a beautiful and much-maligned animal. 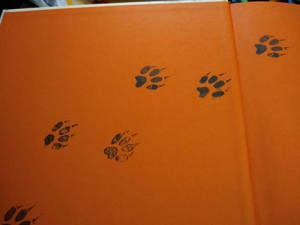 Although I have a child, I bought this book very much for myself and I found it an absolute treasure from the moment I opened the book and discovered the little black fox prints across the endpapers to the moment I closed it with satisfaction a t the end. I’m not an ogre though, I did read it to my son, and he loved it very much too. The narrative works well for adults and children alike. It’s a delightful story of Gaspard’s adventures one night. He makes some new friends, a rather posh cat and a little black dog, on his search for food, and has quite a night of it. 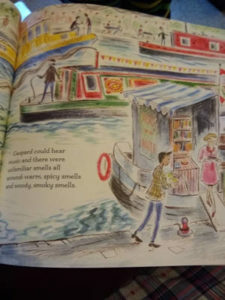 I loved reading about the gorgeous fox’s escapades around the streets and canals of London. The illustrations are stunning, they’re vibrant and colourful and are the perfect accompaniment to the story. As a package this book completely delivers and I highly recommend it. Zeb Soanes is a well known voice on BBC Radio Four’s Today Programme, Shipping Forecast and The News Quiz. He hosts live events and performs with orchestras around the UK and was voted Sunday Times readers’ ‘favourite male voice’ on radio. James Mayhew is an acclaimed illustrator, author, concert presenter and storyteller. He is the creator of the much loved Ella Bella Ballerina and Boy. He published The Knight Who Took All Daywith Graffeg in September 2017. Looks good. I have a wee small child who would love this. It really is lovely, Jules. Thanks for stopping by.